Maximize the potential of your kitchen cabinets by trying out some of these tips. Maximize your kitchen cabinets by trying out some of these tips. They’ll help you with organizing, maximizing space, and labeling. It’ll also make cooking all of your favorite meals simpler. Oh, and storage for your kitchen essentials will be easier too. When it comes to adding those essential elements in our kitchens, we try our best to make them all fit together in a beautiful design. Some, however, like your trash or recycling bin, just never have that elegant feel that we want. That’s why adding a pull-out drawer tucked away inside a cabinet door is the perfect use for one of your lower-level cabinet doors. It allows you to hide that unsightly element of your kitchen away from your guests, while still being easy to access. Are you currently keeping your pans in stacks? Are they hard to reach and, when you need one, do you end up knocking the rest over and spilling them all over the floor? Clear up some of your cooking clutter by using a pan organizer. Designate one of your cabinets to be for storing your pans, and include an organizer that will help you retrieve them easier. Do you have a junk drawer in your kitchen? It’s the drawer in your kitchen that has no specific purpose, so you end up tossing miscellaneous items in there, to be forgotten until months later. You can give that drawer more meaning by creating easy-access drawers in your cabinets. Use functional dividers that will help you keep track of where you’re storing your smallest accessories. Make your spices and seasonings much more accessible and organized with a custom rack. You can alphabetize your spices or categorize them in another way to create your most convenient system. Create the custom rack by adding a shallow, framed cabinet that matches the design of your kitchen, in an available space on your wall. Another option is repurposing other materials to create the rack in one of your existing cabinets. If you have a smaller budget or if you’re renting an apartment, moveable shelving is a great option to add more organization to your cabinets. Use removable hooks and racks held up by an adhesive. You can always move them around if you need to do so. From Kitchen Cabinets to Finished Basements, Kitchen and Bath Depot Has Everything You Need For Your Next Remodeling Project! 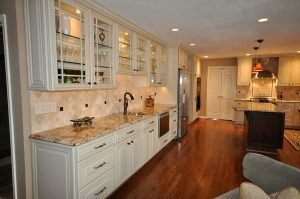 Whether you need beautiful new kitchen cabinets, a kitchen remodel, or a whole home remodel, the experts at Kitchen and Bath Depot are here to help with all of your design and building needs, even in the basement. We provide remodeling services for our valued customers throughout the Maryland and Washington, D.C. area. If you are ready for a quote and to see how we are different than other companies, give us a call at (301) 888-5324 or contact us online. For more tips, follow us on Facebook, Twitter, Google+, Houzz, and Pinterest. This entry was posted on Thursday, January 18th, 2018 at 2:00 pm. Both comments and pings are currently closed.